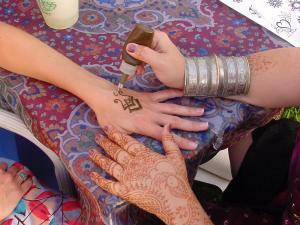 This ancient technique of body art uses ingredients that are all natural plant derivatives, with henna as the main dyeing agent. The mixture sits atop the skin leaving an image that typically lasts between two and four weeks before completely fading. Everything is done freehand as in keeping with the tradition of the art form. It takes only minutes to apply most designs and the artist is able to paint up to fifteen people per hour. Requires 1 skirted cocktail table, two chairs, and sufficient light.